Synopsis: Strapped for cash, a college girl reluctantly takes a babysitter gig for an unusual couple. Not long into the night, it becomes clear that things aren’t exactly what they were supposed to be. This was my first foray into a full-length feature directed by Ti West. Had I seen something previous to this, I probably would have expected the slow burn that I experienced with The House of the Devil. That isn’t to say that I disliked this movie; I actually found this movie quite enjoyable and well done. I was just surprised. One of the things that jump out at you when you watch this flick is how well they captured the feeling that you’re watching a movie from the 1980s. One thing that always seems to be hard to achieve in a period piece is imitating the film stock of the era. Usually it’s just too clean to get fully wrapped up in the idea that it was made long ago, but here the effect works perfectly. If it weren’t for the inclusion of Greta Gerwig in the cast, I would’ve had to go on IMDB to confirm that this was made five years ago. Not much happens in the movie, if I’m being completely honest, but for the first hour, the movie is able to build the anticipation masterfully. Very slowly, the movie reveals itself to both the main character and the audience. Throughout the movie, we’re left to guess what is waiting around the corner and it isn’t until the third act that we finally are let in on the whole plot. Up until the third act, this movie would get a zero in the gore department. Once the finale sets in, it gives you a decent amount of blood in a short amount of time, but this is still not all that soaked in blood. The tension in this film is palpable throughout, even when nothing is really going on. I wouldn’t call in “scary” in the traditional sense, but it’s pretty unnerving. There’s nothing to report here. The main girl is cute, but she doesn’t show anything. 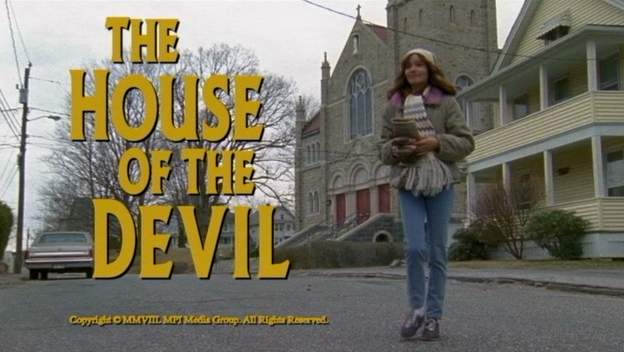 The House of the Devil could probably be a divisive movie. There isn’t much that really happens, but if you’re patient, it rewards your time for the most part. They nail the aesthetic of a movie in the 1980s perfectly and the tension makes the film a nail-biter.